Super soft and comfortable! Provide real warmth on a chilly evening. We believe this elegant shawl will become your new favorite fashion accessories. Great for wedding or just wrap it around your neck for a soft and warm feeling. Main features Material: Chiffon Occasion: Casual,Party,Evening Prom Size in Inches: Length: 78" Width: 29" Tips: Hand wash, dry clean. Fabric:high quality chiffon 29 inches Wide and 80 inches Long. 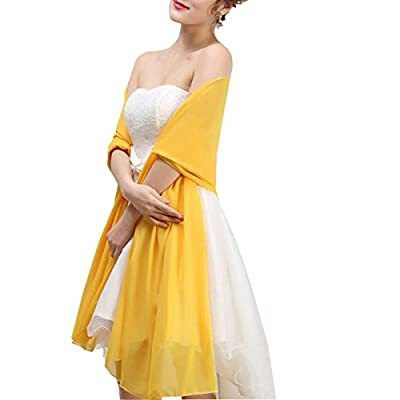 This soft chiffon shawl can perfectly match with your evening dress, bridesmaid dress, weddiing party dress, homecoming dress, or reception dress. Nice gift for friend, bride, bridesmaid, mother or sisters. custom color is also available, you can just send us your ideal color image or your dress color by email.